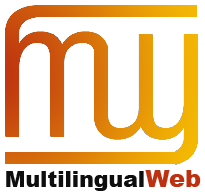 The MultilingualWeb initiative is concerned with standards and best practices that support the creation, localization and use of multilingual web-based information. Through W3C workshops open to the public and various communication channels, it spreads information about what standards and best practices currently exist, and what gaps need to be filled. The news aggregation below and the social media channels linked to from this page also provide information about standards-related developments that affect the multilingual Web. The MultilingualWeb represents a rallying point for initiatives concerned with improving internationalization and localization of the Web. Various European Commission projects have been run in association with the MultilingualWeb brand, and have provided funding and support for additional workshops. Get information about your web pages and check them for internationalization issues using the i18n Checker. Follow all the home page news on Twitter. Follow the home page news and leave comments on Facebook. Follow the home page news using an RSS feed. Find out about the W3C Internationalization Activity. The LIDER project is funded by the European Commission through the FP7 Grant Agreement No. 610782. The MultilingualWeb-LT project is funded by the European Commission through the FP7 Grant Agreement No. 287815 (project name LT-Web). The MultilingualWeb project, April 2010-March 2012, was funded by the European Commission through the ICT PSP Grant Agreement No. 250500, and as part of the Competitiveness and Innovation Framework Programme.